Orange, CT, and (LA Auto Show) Los Angeles, CA – November 28, 2012 – Krell Industries, LLC, the leader in high performance music and home theater systems today announced that the 2014 Acura RLX will be the first-ever automobile to offer a premium audio system produced in collaboration with Krell Industries. After decades of satisfying home audio enthusiasts with the most accurate, three-dimensional, and dynamic sound available, Krell Industries was able to replicate the same high-end performance in the luxurious interior of the 2014 Acura RLX. Each component of the premium audio system has been designed to surpass any car audio solution on the market today. 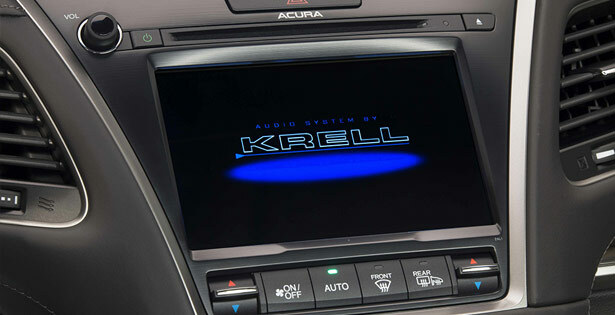 To insure that the system had the power and range to meet the demanding needs of the automotive environment, Acura embraced Krell Industries’ philosophy of musical detail, three-dimensional sound presentation and extreme volume capability. The system’s most important main amplifier channels feature the same robust, high quality bipolar power transistors used in flagship Krell home amplifiers. The result is an amplifier that has 1/3 less distortion than a leading competitor’s flagship luxury car amplifier and power and headroom to meet the obstacles that the road will throw in its way. The system’s tweeters are composed of lightweight magnesium cones that create extraordinary musical detail and extended high frequencies without any trace of harshness. The speakers employ metal grilles that are inherently stronger than the plastics used for most car audio systems. With this strength, the grille can have more open area without compromising its integrity or sound performance. Metal grilles also vibrate less than typical plastic grilles, and this combination yields a grille that is as close as possible to nothing at all. Even more impressive are the system’s six mid bass drivers that are made from Zylon – the world’s strongest super fiber. This very rigid material is perfect for speaker manufacturing. Zylon responds very quickly to a musical input but more importantly than that; it stops moving when the musical signal stops. Polypropylene cones, which are used in the vast majority of car audio speakers, continue moving well after the music stops. With less unwanted vibration, the sound quality is much cleaner and more detailed with Zylon based speakers. Rounding out the speaker complement is a potent carbon fiber composite subwoofer. The dedicated 100 Watt subwoofer amplifier insures that low frequency music is reproduced cleanly and with substantial impact. “The 2014 Acura RLX features a new premium audio system that’s been developed by Acura in conjunction with Krell Industries. The new Krell Audio system delivers a musical experience full of rich detail, three-dimensional imaging and striking dynamics. This system sets the bar for performance audio in the automotive world,” said Jeff Conrad, Vice President and General Manager of Acura Sales. The 2014 Acura RLX will be on display at the Los Angeles Auto Show, November 28 – December 9, 2012, held annually at the Los Angeles Convention Center. Car enthusiasts and audio lovers unfamiliar with Krell Industries’ high-end home audio systems will be able to experience the powerful sounds of a Krell Industries car audio system for the very first time. Founded in 1980, Krell Industries is the world’s premier manufacturer of high performance audio and video equipment. Its amplifiers, preamplifiers, CD/DVD players, surround-sound processors, and loudspeakers have won acclaim in countless reviews, and among audiophiles worldwide. For more information, please visit www.krellonline.com or call 203-298-4020.